← How to convert files of AutoCAD to pic? 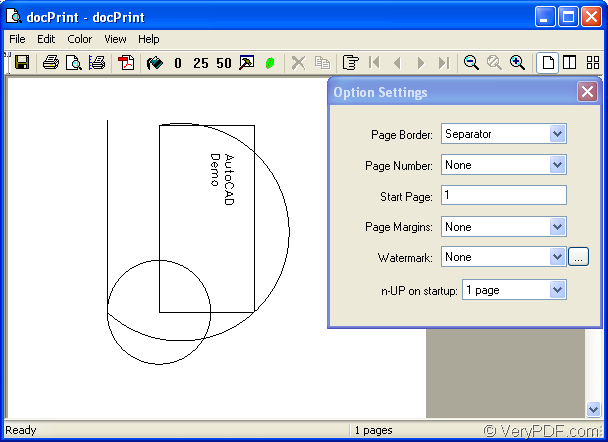 docPrint Document Converter Professional can help you to convert AutoCAD to pcd perfectly only by some easy clicks. docPrint Document Converter Professional(docPrint Pro) is a software product that dynamically converts MS Office 97/2000/XP/2003/2007, WordPerfect, AutoCAD DWG, PostScript, Adobe Acrobat PDF and many other document types to Adobe Acrobat PDF, PostScript, EPS, XPS, PCL, JPEG, TIFF, PNG, PCX, EMF, WMF, GIF, TGA, PIC, PCD and BMP etc formats. It works in both GUI version and Command Line version. With docPrint Document Converter Professional you can convert your documents from and to 50+ formats easily. There are three applications in docPrint Pro, which can realize the same functions, they are GUI application, command line application and virtual printer which contains docPrint and docPrint PDF driver. You can choose anyone according to your needs.You can download docPrint Pro at the website http://www.verypdf.com/artprint/docprint_pro_setup.exe. 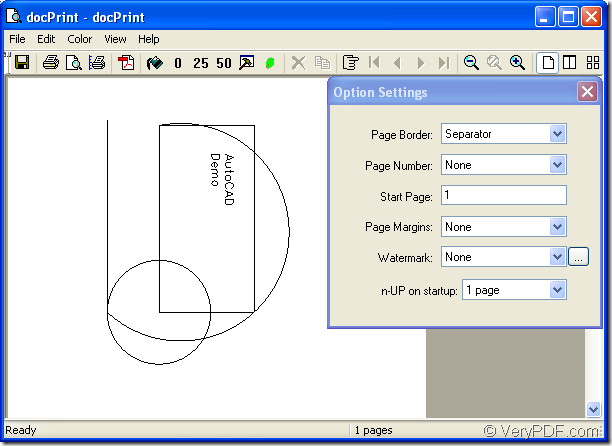 If you want to use the virtual printer only instead of the GUI and command line application, you can download docPrint Document Converter standard version which only contains the printer application at http://www.verypdf.com/artprint/docprint_setup.exe . This version is cheaper than the Pro version. Click “Start”—“Printers and Faxes” and in the dialog box “Printers and Faxes”, you should right click “docPrint” and click the option “Set as default printer”. Then you will find there is a small little check shape above docPrint, which means the printer has been changed as the default one. Open the dwg file in AutoCAD and click “File”—“Plot” to open “Plot-model” dialog box, in which you should choose “docPrint” as current printer in “Name” combo box then click “OK” button. After opening the dwg file, you can use the hot key “Ctrl”+ “P” to open “Plot-model” dialog box and do the same work next. Or you can right click the dwg file and click “Print” option instead of opening the file if docPrint is the default printer. In “docPrint” dialog box showed in Figure1, please click “File”—“Save as” or use the hot key “Ctrl”+ “S” to open “Save As” dialog box showed in Figure2.You can also click the icon in the toolbar. 1.Specify the directory in “Save as” combo box for the target file. 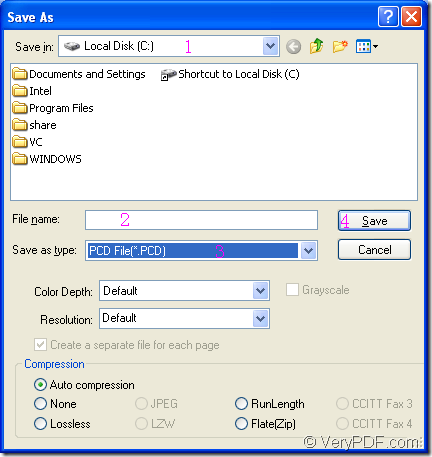 2.Edit the name for target file in “File name” edit box. 3.Choose the file type in “Save as type” combo box. 4.Click “Save” to start the conversion. Then the conversion of AutoCAD to pcd will run itself and you will get the target file in no more than ten seconds. Convert pxl to ps and rotate page via command line? How to create slideshow from video? How to convert documents of Microsoft Office PowerPoint to PCL? One Response to How to convert files of AutoCAD to pcd?